What Does it Mean to be Energy Efficient? Energy efficiency means to reduce your consumption of power. Your first step is to reduce your electricity consumption. This will save you money on utility bills and lower your dependence on fossil fuels. Energy efficiency can have a positive impact on the environment. In the United States 40% of the energy used comes from producing electricity, much of that generated from coal plants. If you are looking at going off the grid (or even grid-tied) you need to plan on using as little electricity as possible. In that way, you can develop a system that is energy efficient and is easy to power off a smaller system. The size of the solar or wind system you buy is directly related to the amount of energy you will use and the amount of sun and/or wind your home requires. How do I Become More Energy Efficient? Take a good look at your home. Where are you using power? What appliances use the most electricity? You can buy a watt meter to help you answer those questions. How does my behavior affect my energy use? Remember your mother always telling you to turn off the lights when you left a room? Well, she was right. Your behavior plays a big part in how much energy you use. When using renewable energy you need to be conscious of your energy use. These are important terms to know when you are evaluating your energy usage. A good example is to think of electricity as water flowing through a pipe. Just like water flows through a pipe, electricity is the flow of electrons through a wire. An amp is the volume or the amount of current flowing through a wire (or water through the pipe). So how fast does the energy flow is the amp? The pressure of the water is the voltage. 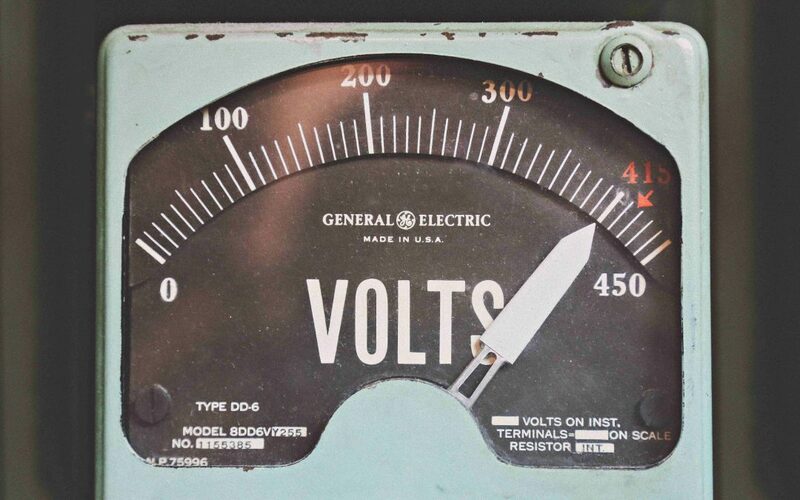 Volts measure the force of the flow. Watts is the power supplied by the flow of electricity – or water flow in our analogy. You get watts by multiplying amps times volts. A watt tells us how much energy is generated or consumed. For example, if you turn on a light that has a 60-watt bulb in it, then that lamp is consuming 60 watts of energy for every second that light is on. In solar terminology, you may see the expression kW or kW-h. This stands for kilowatts and kilowatts per hour. This represents how many watts are used per hour. The first acknowledgment that most people when using a stand-alone system or off the grid is that you can not run everything. Well, you could but it would be counterproductive and very expensive. Who wants to spend $5000 on solar panels just to run an electric stove when $5000 can completely power a small home or cabin. In off-grid terminology, a load is how much electricity something uses. Heavy loads are not practical to use. Things that need to produce a lot of heat, for instance, electric stoves and electric heaters use an amazing amount of energy. Surprisingly many small appliances such as toasters and convection ovens also use a lot. Air conditioning is also a big user of energy. Now if you are on a grid-tied system you can have your electric stove and central air conditioning because the grid-tied electric will kick in when you use them. But remember even with a grid-tied system the more of “their” energy you use the less of “your” money you will save. Every electric product sold has a chart that will tell you how many watts or amps it uses. Energy Star products are very good at this and often give you comparison information as well. If you are not ready to leave the grid yet, it is still a good idea to track how much electricity you are using. Several products such as smart plugs and monitoring systems help you to control and monitor your electric use. Knowing how your electric product uses energy is important. Some electric appliances use electric through cycling. That means that the product is not “on” 24/7 but cycles on and off to do its job. A refrigerator is a good example of this. The unit will come on when it needs to maintain the desired temperature. And will turn off when the desired temperature is attained. Some appliances such as a washing machine are on the whole time they are in use but are off when they are not in use. Many electrical loads are using electricity even when they are off. Electronics such as TV’s and computers do this. The Lawrence Berkeley National Laboratory (LBL), states that the average American home has up to 40 products that are constantly drawing power. Also, anything with a digital clock such as a microwave has a phantom load. These amounts may seem very small but they do add up. For example, your TV can have a phantom load of 5 watts a day. That’s 1,825 watts a year which can be doing good elsewhere. To help alleviate phantom loads you can plug small appliances into a surge protector and then turn the surge protector off when you are done using the appliance. I couldn’t resist commenting. Perfectly written! Hello there! This article couldn’t be written any better! Reading through this post reminds me of my previous roommate! I will immediately grab your rss feed as I can not to find your email subscription link or e-newsletter service. Thanks for your comment. We are glad you enjoyed it! You can subscribe to our newsletter at the upper right corner of every post (on a desktop) or scrolling all the way down (on a mobile).